Long on the palate, this superb Robusto, with delicate chocolate and gingerbread fragrances is a hidden treasure from Cuba. The Regios remains a medium bodied cigar, but the flavors and steady burning accentuates its plenitude and roundness giving the impression that this cigar is stronger than it actually is. Can be enjoyed young but may come across as harsh. 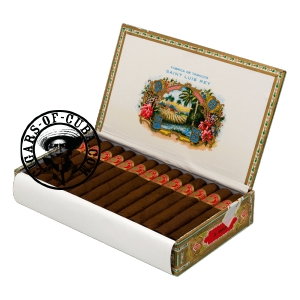 Time will give life to the rich flavors and the cigar will really come together at about 5 years of age. This is a medium strength and well balanced Hermoso No 4. Very pleasant and easy going cigar with a woody flavor. Recommended for an introduction to Robustos or for an afternoon cigar.